* Increasing the labour force participation rate among older workers. To increase Singapore's pension system grade and compete for a higher global ranking they would need to remove barriers which currently prevent movement in supplemental retirement schemes and customised schemes for both Singaporeans and non-residents. the next mopve the government is set to make is to account for the people who cannot save enough suring their working lives. Retirees are set to recieve an annual "bonus" after turning 65. The government will also allow people to make some lump-sum withdrawals after they have retired, rather than receiving only incremental payouts. "We need to build more flexibility into the CPF system and give CPF members more choices," says prime Minister Lee Hsien loong. Singapore's pension system is one of the oldest and most developed national schemes in Asia. The system rests predominantly on one pillar: the Central Provident Fund, which provides for most social security functions. Social risk pooling and redistribution does not take place, a comprehensive social security system does not exist and individuals rely exclusively on defined contribution funds accumulating in the individual accounts of the Central Provident Fund. In addition, a non-contributory pay-as-you-go pension scheme, otherwise known as the Government Pension Scheme, exists for some categories of civil servants. There is also a Savings and Employees scheme for certain categories of armed forces personnel. The Supplementary Retirement Scheme, a voluntary private pension scheme without employer involvement that enjoys tax advantages, completes Singapore's pension landscape. Given a low fertility rate and increasing life expectancy, Singapore belongs to the group of Asian countries hardest hit by demographic change. Singapore is set to become one of the oldest countries in the world, meaning that it faces major demographic challenges in the years ahead. The old-age dependency ratio will worsen from 12 today to 59 in 2050. The median age will also soar from 37.5 to 53.7 years by 2050. Given high net immigration rates, the non-resident population in 2006 grew at a rate of 9.7%. Singapore's population is set to continue growing until it peaks in 2035. In 2006, the CPF had an asset volume of EUR 63.1 billion (SGD 125.8 billion); we expect an annual growth rate of 5.9% until 2015. Assets in the Supplementary Retirement Scheme amounted to EUR 578 million (SGD 1,17 billion); our projections foresee a CAGR of 14.8%. The Central Provident Fund (CPF) is the statutory authority that administers Singapore's public pension system. Established in 1955 by the British colonial administration, the CPF was intended to provide retirement income security for private-sector employees. With continuous amendments over the past five decades, it has developed into a multi-purpose fund consisting of a variety of different schemes. The major schemes under the CPF other than for retirement purposes include healthcare, home ownership and insurance schemes for family protection. It also comprises an asset enhancement scheme that allocates a portion of accumulated assets to products offered by external financial institutions. In contrast to the majority of other publicly managed pension schemes, the Singaporean system operates on a fully funded basis. The CPF does not include social risk pooling and redistributive elements. Individuals rely exclusively on defined contribution funds accumulating in individual accounts. The CPF covers private and most public sector employees as well as the self-employed, who may join on a voluntary basis. In recent decades, total membership in the fund has nearly tripled. At the end of 2006, it had over 3.1 million members with assets amounting to EUR 63.1 billion (SGD 125.8 billion). In relative terms, CPF assets account for 60% of GDP. The balance of the CPF has shown a steady growth rate of 20.6% p.a. since its inception in 1955, which can partially be attributed to increasing contribution rates. The CPF is managed by a tripartite board of government, employee, employer and industry representatives that is appointed by ministers. The CPF is responsible for the custody of funds and for administering the programme. However, it does not have any investment responsibilities. The scheme operates on a fully funded basis and is financed by employer and employee contributions that are credited to three accounts. Employees with monthly earnings above EUR 247 (SGD 500) are obliged to contribute to their CPF accounts. A lower limit applies to employers, who must pay CPF contributions for employees whose monthly wages exceed EUR 25 (SGD 50). Monthly contributions are capped at a salary ceiling of EUR 2,224 (SGD 4,500). The share contributed to the different accounts varies depending on the employee age structure. The lion's share is distributed to the Ordinary Account. Savings from contributions accumulated in the Ordinary Account may be used to buy residential and non-residential property as well as approved assets and insurance funds. The account balance can also be used to cover education costs and can be redirected to affiliated accounts. Contributions directed to the Special Account are dedicated to old age, contingency purposes and investment in retirement-related financial products. Medisave Account savings are used to meet hospitalisation and medical care expenses and to pay for approved medical insurance premiums. From the age of 55 onwards, CPF members have an additional Retirement Account, which is used to set aside a statutory Minimum Sum, which must be held for the exclusive purpose of retirement. Currently, the Minimum Sum amounts to EUR 49,232 (SGD 99,600) and will be increased continuously to EUR 59,316 (SGD 120,000) by 2013. The Minimum Sum is taken from the Special and/or Ordinary Account balances. Since the housing crisis in Singapore in the 1960s, the state has been involved in improving the population's housing situation. Homeownership plays an important role in Singapore, with over 90% of the population owning the homes they live in. In order to finance property purchases or pay monthly housing loan instalments, CPF members may use their Ordinary Account balances. The basic idea is that owning a house provides financial security in retirement. However, in the past, withdrawals for property purchases far exceeded 100% of the original price of the property. In order to safeguard retirement savings, the amount that can be withdrawn for property purposes has been reduced. For the majority of the workforce, total contributions to the three accounts amount to 34.5% of total wages, of which 14.5% are made by the employer and 20% by the employee. Effective from July 2007, the employer contribution rate was increased by 1.5 percentage points. From the age of 50, contribution rates decrease to encourage the employment of older people. While contributions are split between the different accounts, the Ordinary Account attracts the bulk, especially for younger people. Generally, effective splitting rates depend on the age of the employee. 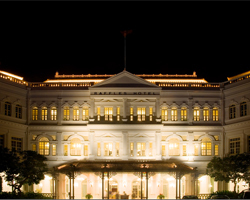 The Singapore Government Investment Corporation (GIC) is the body responsible for investing the scheme's assets. The vast majority of capital in Ordinary and Special Accounts is held in CPF guaranteed accounts, which must be invested in non-marketable government floating rate bonds, issued primarily to the CPF. At the end of 2006, EUR 53.4 billion (SGD 108 billion) were invested in the specially issued Singapore Government securities. 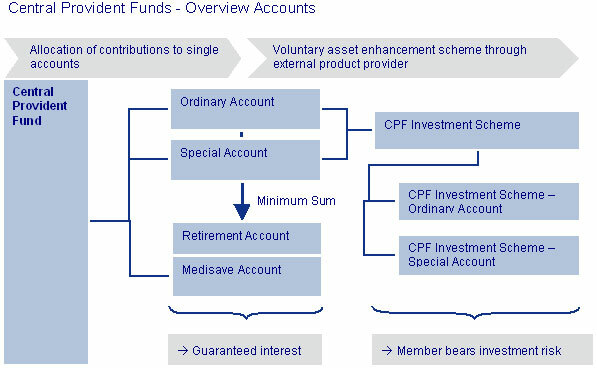 Assets outside the guaranteed accounts are invested through the CPF Investment Scheme. Members who wish to manage and enhance their CPF savings and returns can do so through the CPF Investment Scheme (CPFIS), which provides CPF members with more choices in investing their savings. All members who are at least 21 years of age are eligible to participate. The CPF Investment Scheme comprises the CPFIS – Ordinary Account and the CPFIS – Special Account, into which members may invest the full balance of their Ordinary and Special Accounts. From April 2008, restrictions will apply to the CPF investment scheme. The first EUR 9,900 (SGD 20,000) from the Ordinary and Special Accounts combined will no longer to be used for the CPF Investment Scheme. Money already invested will not be affected. This measure will reduce assets available for investment in externally managed products to approximately EUR 20.8 billion (SGD 42 billion). An additional 10% of investable savings in the OA can be invested in gold, gold ETFs and other gold products. All investments must be made in Singapore Dollars. The asset management of the CPF Investment Scheme is outsourced to external service providers. Since its introduction in 1997, EUR 15.6 billion (SGD 31.6 billion), or 24.5% of total CPF assets, have been transferred to the CPF Investment Scheme. Of this amount, EUR 12.8 billion (SGD 25.9 billion) have been invested in the CPF Investment Scheme - Ordinary Account and the remaining EUR 2.8 billion (SGD 5.7 billion) in the CPF Investment Scheme - Special Account. The bulk of assets lies with insurance policies. From the age of 62, CPF members may claim their pension. Beneficiaries are free to buy a life annuity, place their assets with a participating bank as a fixed deposit or leave it in their Retirement Account to earn interest. If they do not choose one of these options, the default option applies, through which the beneficiary will receive payments for a period of 20 years. The government plans to implement a National Longevity Insurance Scheme with compulsory longevity insurance under the umbrella of the CPF. As life expectancy rises, beneficiaries run the risk of running out of savings. Annuities aim to secure lifelong income. Beneficiaries will have to take a part of their Minimum Sum to buy a deferred longevity insurance at age 55, which will become payable when the beneficiary gets 85. For the first time, the new scheme contains a risk-pooling element, as premiums are combined in a common pool. While the National Longevity Insurance Scheme has been drafted, an implementation date has not yet been determined. The government still has to work out the detailed scheme in collaboration with industry representatives. Mandatory CPF contributions are tax-exempt for both the employer and employee. The same applies to pre-retirement and retirement withdrawals from the accounts. The EEE taxation system applies. Both the employer and employee may voluntarily contribute to the CPF, but these contributions are not subject to tax breaks. There are two other special public pension schemes covering certain categories of government employees: the Government Pension Scheme for public sector employees and the Savings and Employees Scheme for certain categories of armed forces personnel. The number of public servants covered by the Government Pension Scheme has declined substantially in recent decades. This has mainly been due to the tightening of eligibility criteria, which shifted most civil servants to the CPF framework. At present, only a few public services and political appointees are covered by this scheme. With its exclusive reliance on fully funded accounts in the Central Provident Fund, complemented by voluntary retirement savings, Singapore's pension system is quite unique in Asia. It is a mature system that is "demography-safe" because it is fully funded. Given Singapore's likely demographic development, this is very important. The absence of a social security system means that individual responsibility plays a major role. The main challenge for pension policy is to make sure that not too much capital is withdrawn before retirement, which is often the case. Recent reforms that have increased the minimum amount to be left in the accounts are a step in the right direction, while the plans for a National Longevity Insurance Scheme intend to prevent retirees from running out of money. These reforms have the potential to remedy the weaknesses arising from the multi-purpose character of the Central Provident Fund, which is an otherwise consistent system.